To save screen space, Ubuntu Unity uses Mac OS X style global menu that integrates applications’ menu bar into the top panel. 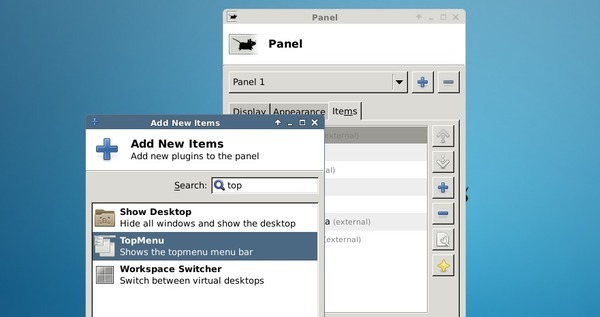 Thanks to TopMenu developer and Webupd8 Team for building the project into PPA, now XFCE Desktop has a plugin to enable the Mac style global menu bar. For (X)Ubuntu 14.04, (X)Ubuntu 14.10, (X)Ubuntu 15.04, and Linux Mint 17/17.1, this Xfce plugin is available in the webupd8 PPA. 2. Update system package cache, install “xfce4-topmenu-plugin” as well as other extra plugins. 3. After installing this plugin, you have to restart Xfce session by logging out and back in to load the Topmenu modules. 4. Finally, right-click on panel and navigate to Panel -> Panel Preferences. Under items tab, add “TopMenu” and change its position.